#1 Digital marketing is a saturated market place. We are all constantly bombarded online with ads and in email & social media with adverts trying to get our attention. Many of us now just switch off and learn to ignore these digital marketing messages. And with digital marketing spend increasing year on year – there is more and more stuff trying to get our attention online – and we switch off. But due to many businesses spending more on digital and less, or even none on traditional print – that leaves less competition in the physical real world beyond the digital realm, so leaflets can appeal to those people who have learned to switch off to marketing messages when online. In essence it’s harder to switch off to a leaflet that has been posted through your door, that it is just just delete an email or click to leave a web-page. #2 You can’t beat a physical, tangible thing that you can hold and keep! If designed well and effectively to appeal to your target audience, a leaflet can be a thing of beauty and interest, which compels a potential customer to pick it up and read. We like physical objects, and as well as the design, the print, paper choice and finish can further convey a touch of quality and professionalism. Digital forms of communication just don’t have this tangible quality. What’s more – if your leaflet really appeals to your audience – then it is much easier for them to keep the leaflet as a reminder to actually follow up on it and either call, email or visit a website. Its a constant physical reminder to do something about the leaflet. Because leaflets are a relatively small piece of paper, often only single or double-sided, then by their very nature they force you to condense and distill your marketing message, get to the point and summarise the key benefits of your business or service in a nut shell. In our time poor world – where potential customer attention spans are minimal, then a leaflet with a clear and concise message is likely to really appeal to someone as a first point of contact to someone who has not come across your business or service before – and inturn this powerful message can lead to greater leads and increased enquiries. A leaflet that is distribute din the right place to the right audience is hard to ignore for potential customers. In terms of printing marketing materials, leaflets can offer the biggest bang for your marketing buck, as they can cost from as little as 4p a leaflet (eg. For an expert design service including print and delivery, I charge £200 for 5000 leaflets) So a potential new customer for only an initial 4p spend is an excellent return on investment really. You might think you can really cut costs by choosing the cheapest design service out there, or worse do it yourself, but if you don’t understand how to create the most effective leaflets then this money would be a wasted investment (and may even cause damage to peoples perception of your business). 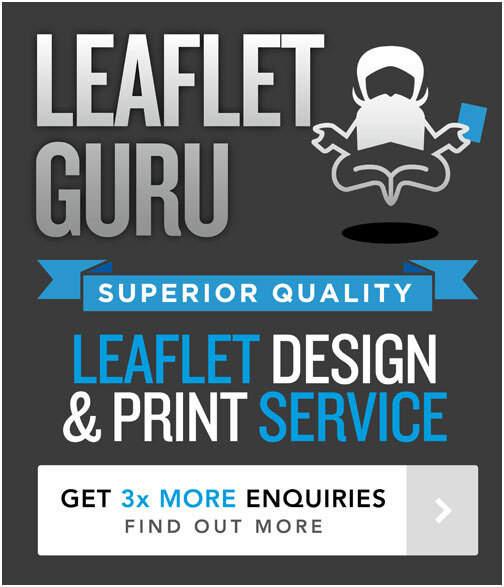 So choose very wisely when you to decide who to get to design and print your leaflets.